The vast majority of time you’re using a drill, you want your hole to end up as straight as possible. And the BullseyeBore promises to make it a lot easier to keep your drill at a perfect 90-degree angle using a series of laser-projected rings that distort when it’s not straight. 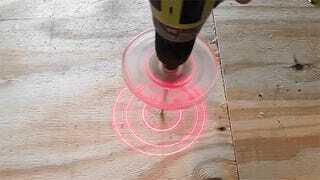 The battery-powered BullseyeBore uses a simple red laser to project three red rings onto the surface of whatever you’re drilling. In order to ensure the drill is as straight as possible while you’re working, you want the outer ring to be perfectly concentric to the inner two (which don’t distort). The size of the outer glowing ring also provides a visual indication of how deep the drill bit has gone. If the ring starts out at four inches in diameter and ends up being just two, it means the drill bit has penetrated the work surface to a depth of two inches as well. If you’re trying to avoid going all the way through the material you’re drilling, that alone could make the BullseyeBore a must-have addition to your toolbox. Sadly, though, the BullseyeBore isn’t available for purchase—at least yet. Its creators are planning two versions—one that attaches to the chuck of any drill and accepts bits on the other end, and one that’s actually integrated into a chuck directly. But they’re still on the hunt for partners and OEMs to help them bring their invention to consumers.